Enjoy this tasty heart healthy snack for your next celebration! For Tortilla Chips: Stack tortillas and cut into eight equal triangles (48 wedges total). Put triangles in single layer on two baking sheets. Drizzle triangles with canola oil and sprinkle with garlic powder and black pepper. Bake for 10 to 11 minutes or until chips are light brown and beginning to crisp. Remove from oven, place baking sheets on cooling racks, sprinkle evenly with 1/4 teaspoon salt and cool completely (about 10 minutes). As chips cool, they will become crisper. Store in airtight container up to 24 hours for peak flavor and texture. 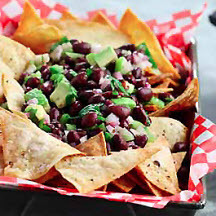 For Black Bean-Avocado Salsa: Combine avocado, tomatillo, jalapeno, cilantro, red onion, black beans, canola oil, lime juice, vinegar and salt in medium bowl. Serve with tortilla chips. Makes 6 (1/3 cup) servings. *Note: The leftover black beans may be stored in an airtight container in the freezer up to one month for later use. Nutritional Information Per Serving (1/6 of recipe): Calories 130; Total Fat 10g; Saturated Fat 1g; Cholesterol 0mg; Sodium 200mg; Carbohydrates 9g; Fiber 2g; Protein 2g. Recipe and photograph courtesy of CanolaInfo.